Friends, family and fireworks are the best parts of 4th of July party! 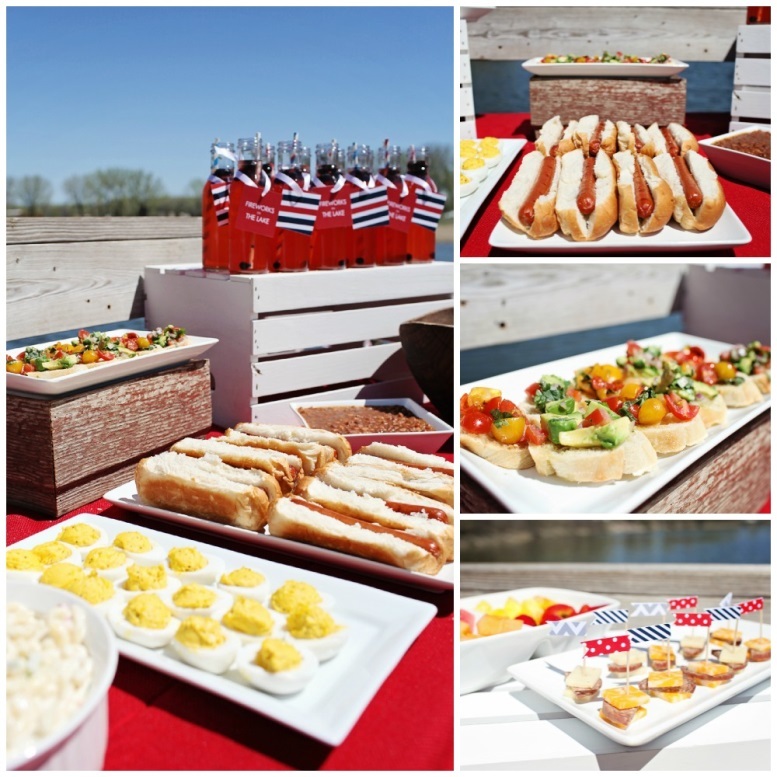 We love throwing parties and thought it would be fun to have a picnic for our team to share all of our 4th of July ideas with you. Now you can have a patriotic party that is just as great! 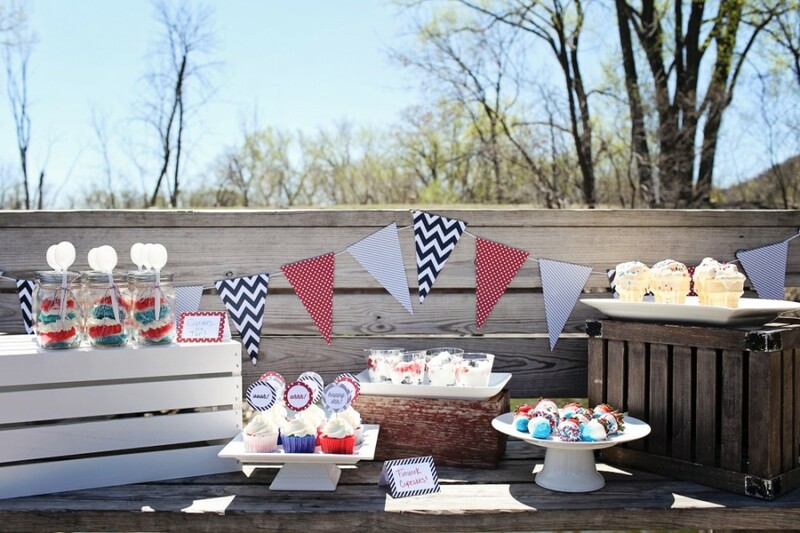 We chose some of our favorite products to help set the mood for our red, white and blue theme, and created some new party decorations (which you can download here) to add some flair to this party. It all starts with an invite, so we chose our Stamped Fonts Party Invitations and changed the colors to red and blue. 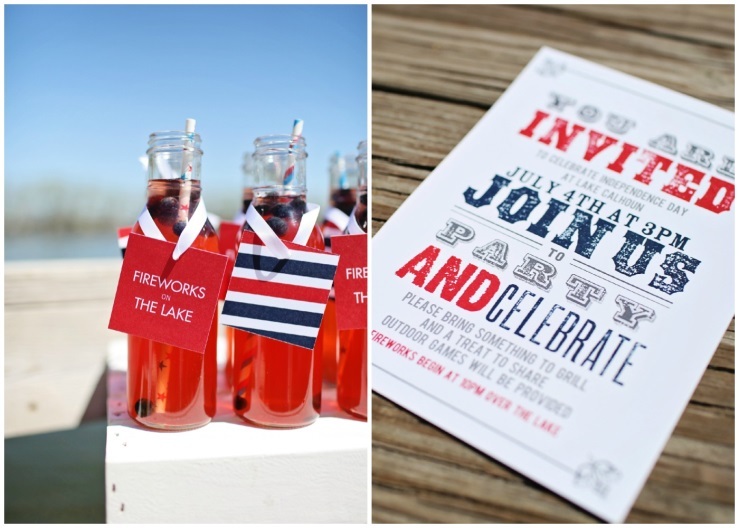 (Check out our party invitations collection for more 4th of July ideas.) We also repurposed our I Do Stripes Wedding Favor Tags into some fun tags for our milk bottles, which we filled with festive red and blue beverages. Like most of our team parties, this one was pot-luck style. In order to get all of the essentials needed at a 4th of July party we asked each team member to bring a few specific items, using their creativity, of course! As you can see, they did pretty well! All the essentials made it: hot dogs, deviled eggs, baked beans, macaroni salad, fruit and some other fun things! 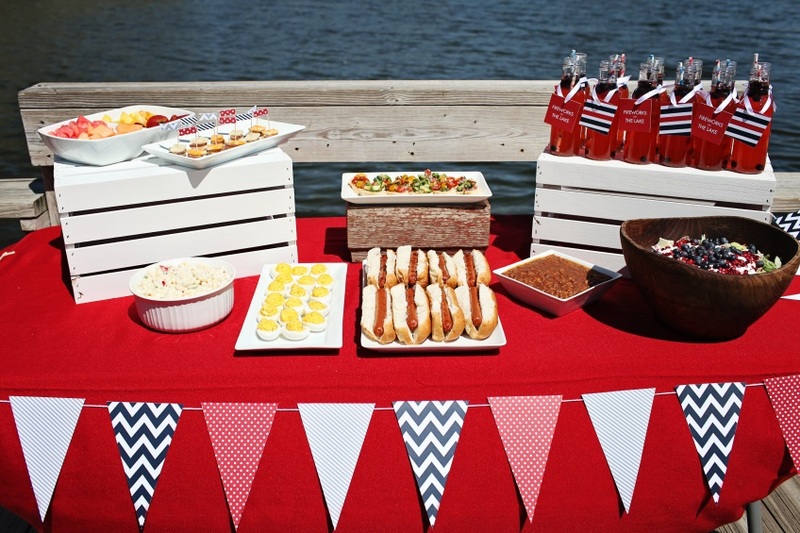 We held our picnic at a nearby lake, and dressed our table with a red tablecloth and our free printable banner. The beautiful scenery became our backdrop and the weather could not have been better for a picnic! 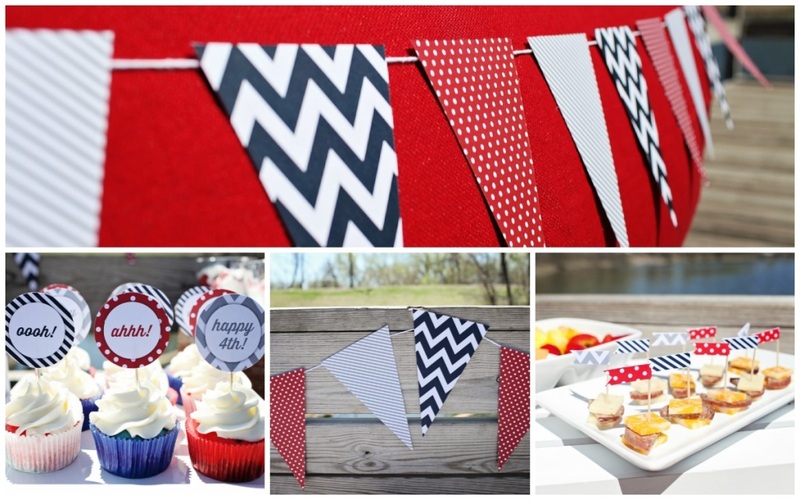 Our creative team created the red, white & blue banners and decorations for this party, and we even made them into free printables that you can download to create your own party decorations! They created flags to make a banner, toothpick flags, cupcake toppers and reversible table tent cards for food labels or place cards! 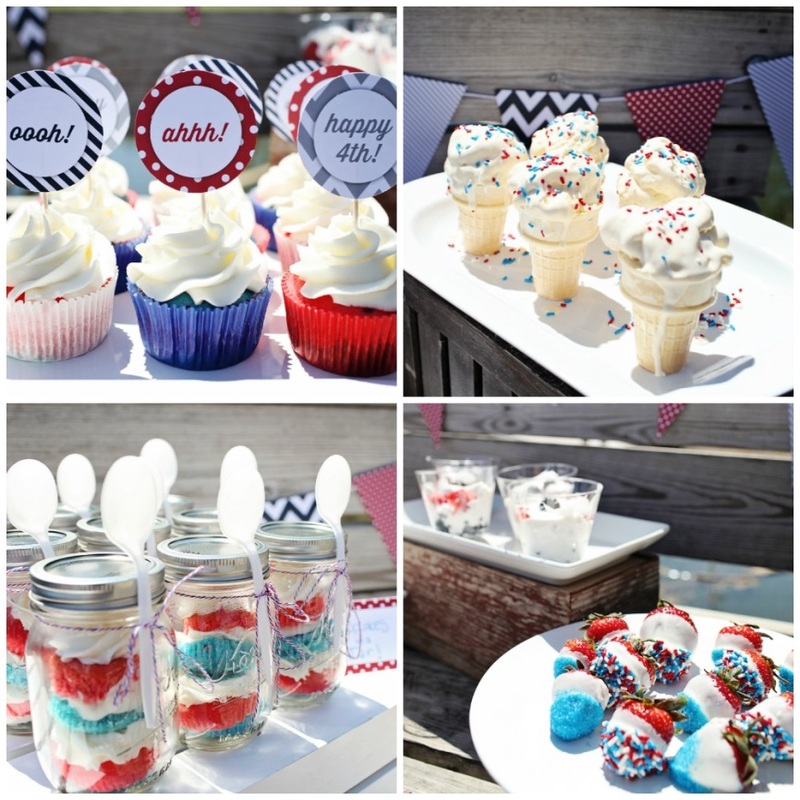 They rocked these 4th of July party ideas! We used the cupcake toppers, table tents and the banner to decorate our dessert table. Included in our dessert selection were cupcakes in a jar, chocolate covered strawberries, cupcakes, fruit with whipped cream, and melty ice cream cones! Using cake stands and crates of different colors and heights gave our table some dimension. Scour your house or thrift stores and get creative with unique things to give your table dimension. Our party was a huge hit with everyone at Pear Tree, and it was fun to see their reactions to the decorations and food when we gathered all those red, white and blue things together. It was amazing! 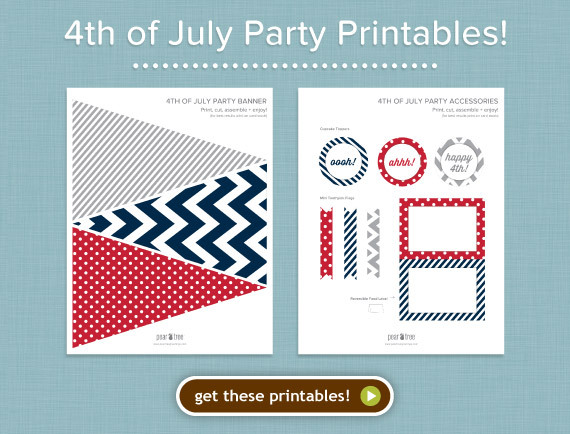 We’d love to see how you used our 4th of July ideas to create your own party. Share your photos on Facebook or comment below with a link to your blog post or Pinterest page!